“Your list is everything.” Truth. “Nothing is more important than your story.” True also. Wait, which one is really the most important? Without a story, you have nothing to say. Without a list, however, you have nobody to say it to. Can we call it a tie? Maybe this is a trick question, but it isn’t tricky. 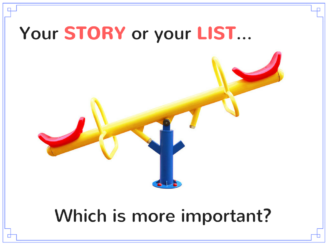 You have to nail your messaging (your story) AND master list growth in order to be successful in marketing. Spend time every month reviewing your list growth strategy to make sure you are indeed growing your list and, even more importantly, that you are attracting the right people to it. Also spend time every month testing and tweaking your message. Track what kind of response you receive from different headlines, stories, offers, or any other messages you create (written word or images). Providing value to your list is your goal so you can build relationships, and the only way to do it is to remain relevant to them. Show some love to your list AND your story and you’ll be fine!